Hunter & Equitation Experts and Horse Show Judges are talking! Here’s your chance to get inside the minds of the nation’s most respected horsemen and horsewomen who have earned the highest-level credentials offered by USEF and USHJA – the big “R” in rated hunter and equitation judges. We’ve tapped the brains of top-rated officials at A-level competitions (Indoors, WEF in Palm Beach, Desert Circuit, HITS, Harrisburg, Capital Challenge and USHJA International Hunter Derbies to name a few) with decades of experiences as trainers, riders, instructors and clinicians, at national and international levels, along side top-notch veterinarians and farriers. AskTheHorseShowJudge.com is not for profit, the judges have graciously donated their time to educate YOU. The growing panel takes time out of long days to answer a wide range of questions, to educate and give back to this sport that is their passion. Not only do hunter judges reveal their idea of a perfect hunter but specific topics are covered; for example, the deduction for a close jump versus a late lead change. In green hunters, is there a preference between a horse that shows Scope in his jump or one that snaps his knees? 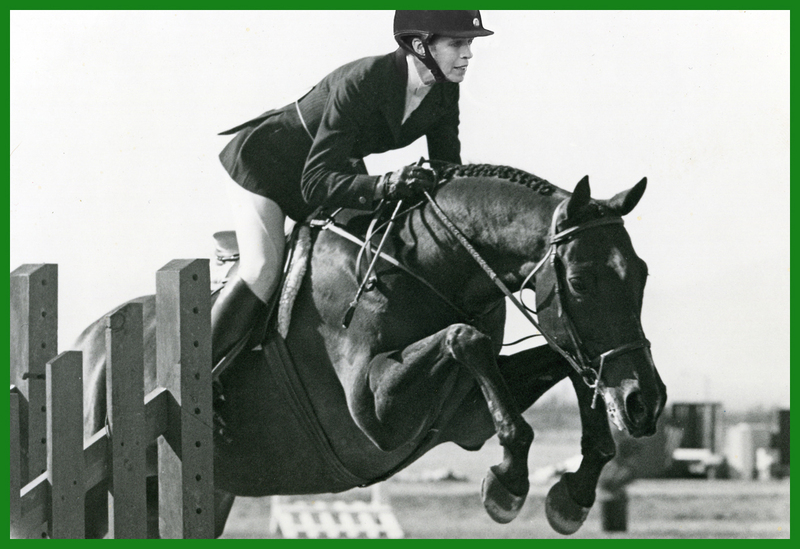 The degree of collection in equitation versus an under saddle class is discussed, along with how much a spook is weighted in a green class compared to an amateur class. Bits, martingales… the judges see it all and here’s your chance to learn. Equitation… seat, leg, hands…what’s most important? Do you think you’ll want to know the favorite work-off tests of the judge BEFORE next week’s horse show? Our horsemen are asked to rate the rider’s position, the attributes of a winning Medal round and those all important extra credit moves. Drop your irons and prepare for an Equitation clinic. It’s great to get to know the judges and their preferences, know they want us to do well. They are open and forthcoming with their answers and they strengthen not only the training of my own horses, but the instruction I give my students. I point them to the site all the time! Many of my clients cannot afford the time or money to get to the bigger shows and the site is a great way to get input from top-of-the-industry judges without showing in front of them or attending a big-name clinic. Straight from the judge’s mouth is how I want my rides critiqued. Sometimes I am so focused on my horse I forget how it looks through the judge’s eyes. What I thought was subjective analysis is now put into performance criteria I can understand. To know what Equitation Tests judges like to challenge riders with; well, that is something I can practice at home! I love the ability to search by topic or a particular judge’s name. It’s basically a virtual clinic of hunter and equitation expertise. For once, I can see the method to the scoring system. Because rules are set that allow limited interaction with the judges at most hunter-jumper horse shows, I couldn’t get constructive reasoning for placings. Until now, I only knew what my trainer and my daughter told me! Because each question has an explanation, I can not only learn how the judges make their selections, but the ABCs of hunters and equitation (that everyone assumes I already know). I can talk to my daughter now in her language! There aren’t enough opportunities for exhibitors to get the judge’s perspective. We are in this business to help you achieve your potential with your horse partners. Not everyone can get to clinics although they are becoming more popular. We feel gratified when we see a good performance and are elated when you improve. We support your commitment to good horsemanship. Let’s take the mystery out of the placings. We’re rooting for you and we have all been where you are. We interview the judges at horse shows after they are done judging for the day. We select judges based on USEF certification, experience and reputation. The judges are not paid, they are volunteers along with everyone else on the site. And we didn’t have to hog-tie any one of them! Once they knew what AskTheHorseShowJudge.com was about, they readily offered generous time commitments and complete, thoughtful answers. The judges were committed to educate. How do you come up with the Questions? We survey trainers, instructors, riders, owners and parents. We added a few of our own and the judges themselves came up with several questions they had been asked or they thought we’d like to know. Do Judges' Answers vary for each question? Yes, based on knowledge and experience. For example, some judges think a strong leg is the first attribute they look at in Equitation. Others say good hands or a secure seat is their priority. You’ll get a well rounded education. Any AskTheHorseShowJudge clinics in the future? Yes! We think it would be a fantastic educational opportunity for trainers, riders and parents to watch a round, then hear the judge’s input and ask questions. We’ll announce clinics on Facebook. Dollars spent getting to the show ring? Horse purchase, training, lessons, equipment, board, horse shows…. Getting the judge’s input before you enter the arena?